Consistently fishing the same small area was all it took to make Alabama's Jamie Horton a champion for the second time on the Ouachita River. The River Region Bass Fraternity club member relied on the same spot over the course of three days to catch 36 pounds, 2 ounces. This total was more than enough to win the B.A.S.S. 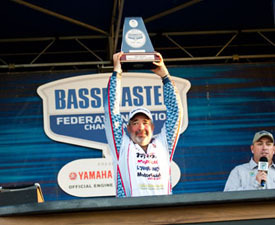 Federation Nation Championship presented by Yamaha and Skeeter Boats, which earned Horton a coveted seat in the 2012 Bassmaster Classic. In addition to his Classic berth, Horton also took home the grand prize of a Skeeter Boat/Yamaha Outboard rig valued at $45,000 and an invitation to fish in next year's Bassmaster Elite Series. While other contenders shied away from Horton's spot since local anglers had told them the water was too low to run there, Horton made the one-hour run and skimmed over thin water at times to reach his honey hole. "I was fishing up at a spillway, and the water has been coming over the spillway when the wind blows out of the north, and the fish were busting up there big time," said the four-time FNC qualifier. "I caught over 30 fish there Thursday. Yesterday the water wasn't coming over as good and I just caught but four there." On the final day, it took him about 30 minutes to haul in a limit from the spillway. "I stayed with them until about 1 o'clock and culled for my last time at 12:30." His best five weighed 9-15, which was good enough to give him the crown. The key to catching his fish in the spillway was to cast into an eddy about the size of a 5-gallon bucket. He was burning a chartreuse XCalibur crankbait and banged it into rocks in about 6 to 18 inches of water. "I could see bass up there busting on shad and I could see their heads out of the water," said Horton, who also won a Bassmaster Series regional event on the Ouachita River the first week of November in 2006. "I just kept on hammering and hammering them." Horton and five other Federation Nation anglers will be competing in the 2012 Bassmaster Classic Feb. 24-26 on the Red River in Louisiana because they finished at the top of their respective divisions in the FNC. The divisional winners headed for the world championship of bass fishing are John Diaco of New Hampshire, representing the Eastern division; Idaho's Josh Polfer, Western division; Tom Jessop of Texas, Central; Indiana's Matt McCoy, Northern; and Chris Price of Maryland, Mid-Atlantic.